Labor Day has come and gone, and here in Seattle we’re headed into autumn fast; this weekend was chilly and rainy. But down south (in the Southern Hemisphere) spring is about to arrive, and this winter many of us in the north will vacation in warmer climes to escape cold weather at home. As I sampled Lauder Men Brasil Dream for Him and Issey Miyake a scent by issey miyake this weekend, I was reminded it’s always toasty somewhere, and summery scents like these not only travel well to beach-y destinations but remind us of summer no matter where we are or what type of weather we’re enduring. Lauder Men Brasil Dream for Him is reminiscent of older Comptoir Sud Pacifique fragrances (those developed before the Great Vanilla Wave splashed into every Comptoir Sud Pacifique perfume vat); Brasil Dream for Him reminds me of L’Eau du Gouverneur…but with more complexity. Brasil Dream for Him (perfumer unknown) contains kumquat, bergamot, coriander, cardamom, white pepper, neroli, nutmeg, cinnamon, oregano, patchouli, labdanum, jalapeño pepper, pimento and leather. 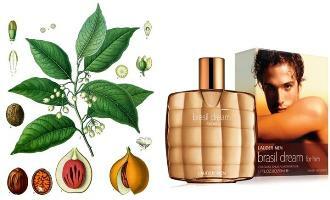 Brasil Dream for Him starts with the most delightful (but most fugitive) of citrus notes: kumquat. After the kumquat note disappears, I smell bergamot mixed with spices: accent on cinnamon, nutmeg and cardamom. The spice accord is light, but persistent, and it doesn’t remind me of food (nutmeg-scented custard or cardamom cookies) but of an open-air spice market where all colorful whole and ground spices are displayed for sale under the hot sun. As the fragrance dries down, nutmeg remains strong and is joined by a bit of pepper, oregano and sheer wood. Thankfully, I do not smell leather at all; a leather note, for me anyway, would take away some of the fresh, “spice island” character of Brasil Dream for Him. In some corner of your home or office do you have an indestructible (forgot to water it? fine!, no sun?, fine!) snake plant (more colorfully known as a mother-in-law’s tongue plant)? If you have not given this plant enough light, water and food, you have probably not seen it flower. Flowering snake plant smells wonderful: its white-green blossoms are rich with nectar and produce a powerful perfume that screams “tropical rainforest!” The snake plant blossoms’ perfume is “spooky”: imagine the scent of a jungle crypt with mingled aromas of cool rain, moist earth and damp, green moss — throw in a bouquet of fragrant lilies and garlands of jasmine to honor a newly interred corpse and you have my impression of a scent by issey miyake. According to Issey Miyake P.R., the perfume is all about the “poetry of minimalism” and the inspiration was “the mountains of Japan….” As you can tell, the Miyake P.R. folks and I got a completely different “vibration” from this perfume, and I guarantee Mt. Fuji smells NOTHING like a scent by issey miyake. Perfumer Daphné Bugey created a scent by issey miyake and it contains notes of lemon verbena, galbanum, jasmine, hyacinth, cedar, crystal moss and musk. If you strain your nasal apparatus, you can smell many of the individual notes in this perfume, but all those flowers, moss, “green” notes and sheer musk produce a zingy, powerful vegetal-floral-earth accord — cool, wet and “of the jungle.” I’m shocked that the Miyake folks describe this perfume as minimalist. If this is “minimalism”, the “opulent” of such a perfume-rating scale would kill those who sniffed it. A scent by issey miyake begins to wane after three hours on skin (you can still smell it, but it’s close to the body). Thankfully, the perfume does not become soapy or too “white” musky as it fades; there are still some residual floral-green notes in the base. Men and women may (of course!) wear any perfumes they like, but I’m betting men (even perfume lovers) smelling a scent by issey miyake will deem it more ‘feminine’ than ‘unisex.’ (For what it’s worth) I do. Issey Miyake a scent by issey miyake is available in 30, 50, 100 and 150 ml Eau de Toilette. Note: images of nutmeg plant (top left) and snake plant (lower right) both via Wikimedia Commons. Great reviews, Kevin. I’ve been hearing good things about A Scent but didn’t realize it had a tropical quality. Does anybody know where it’s being sold? Has it reached Nordstrom etc yet or is it still at Sak’s? Looks like just Saks and NM, from what I can see….so I’ll have to wait awhile yet. And given no travel plans either, it looks like K has given me the worst kind of lemmings…the ones you can’t do anything about. you can go to the airport without actually having to get on a plane. the shops are usually before all the security checkpoints. I always forget about Duty-Free! I’ll check it out this weekend, I’m going out of town. Thanks for the reminder! boojum, for me it’s the opposite — if I’m seriously hooked on the idea of something, it’s more dangerous when it’s close by because I might buy it without really thinking it through! funny….those I can pass up easily, because I know I can stop back and test them again. hard to get is like LE for me…have to grab it before I’m sure in case I don’t get another chance. ugh. Boojum: ha! cross the border into Canada or Mexico? Volunteer to take a friend to the airport? That would require a passport, which, sadly, I’ve never had occasion to obtain. I guess I could send my 5 yr old; she has two of them. Thanks for the info. I’ve had snake plants for years, and have never seen them flower. Interesting. My mother has bushes of them in Fla. I wonders if her’s flower. Will have to ask. C: the flowers are worth the wait…you won’t believe the scent. Oooh. Ok, I think I’m officially excited about these. Thank you, Kevin. I must get samples. That Brasil Dream sounds better than I thought it might be; I recently bought some CSP Gouverneur, so I’m sure I’d like the EL. I’m very unlikely to be in a duty free shop soon though. So ‘a scent’ is as much or more floral as green? You find it feminine but not “too” feminine (whatever that means)? I’ve never smelled sansevieria flowers, or even seen one in bloom. You never know – most airports have a duty free shop. You could call the one in the closest airport and see if they have it in. A friend of mine goes to the airport just to shop duty-free – at least she used to, I don’t know if you can do that anymore. Maybe an enterprising SA would meet you outside of security and hand off the bottle. 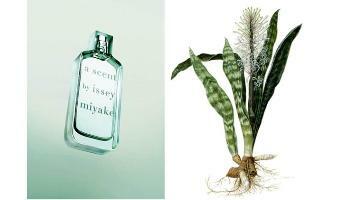 J: “a scent by issey miyake” is very FLORAL-green on me. It’s too femme for me but that’s just me. So is it at all like Fleur de Liane without the aquatic element??? Haunani: no, if memory serves this is very different…more powerful too. great review as usual,I’m thinking vampire on holiday, I can see the ad now. anna: no VAMPIRES please…I live near that coastal vampire pilgrimage site! Let’s go for a zombie instead? Both of these sound great, Kevin. And even though the Lauder has that citrus opening, all the spices would make for a nice touch when attending a crowded winter gathering where something light is required. The Miyake sounds nice, too. Definitely worth a sample, at least, even if it’s about as authentically Japanese as Fresh’s Memoirs of a Geisha release a few years back. A.S.: TRUE! Japan is certainly inspirational for perfumers these days…but the perfumes don’t smell particularly “Japanese” do they? I smelled A Scent a few times, and made my girlfriend smell it also. We both loved it. It is absolutely floral, i dont really get anything else from it.. Now, being a guy, and being completely unable to determine a difference between the smell of one type of flower and the next, i would say there is nothing new or exciting about this fragrance. However, those who can tell the difference should be encouraged to try this. Rictor: in my experience, even just on this blog, it seems guys know the scents of particular flowers more than women do! Thank you for the review, I’m really motivated to try the IM. I love the idea of the flowering snake plant; I don’t recall if they have ever bloomed at conservatory near us. The smell of the conservatory might be pretty close to “rain forest”; one of my favorite places to be, especially on a frigid day. bergere: yes, the scent of many greenhouses is VERY rainforest like. I want to try a scent although I have not liked Miyake so far (never got to try that one everyone is crying over – Feu d’Issey) – too watery. But this one sounds interesting. Tama: this is very unlike what most people consider “Miyakesque”…just discovered Feu d’Issey myself and unfortunately LOVED it…. Oh dear. Hope you can find more than a “try”. The perfume might be good, but it bothers me that it’s called “Brasil Dream”. I was born in Brasil and lived there till I was in my mid-20s. Kumquat is something I never met till I moved here. I was interested in food and spices, but most Brazilians wouldn’t know what cardamom is. And jalapeño? Couldn’t they have at least listed malagueta peppers, or some other kind that one actually finds in Brazil? Sheesh! Fernando: you’re asking for too much…Americans have not even discovered Clarice Lispector yet! HA! Both sound intriguing, great review Kevin! I hope Brasil Dream (however misnamed it may be) will make it’s way to TJ Maxx at some point – my husband and I can share it! The others made it there, so hopefully this one will too. I have Bali Dream and my sister and I both love it. alltheprettythings…yes, it certainly can be worn by women too! A Scent almost sent me convulsing. It must be the combination of jasmine and hyacinths that made the fragrance screech “GREENGREENGREEN” to me. And it wasn’t so much rainforest green but hayfever-inducing pollen green. eminere: it’s a strong one for sure…. I am very curious about Brasil Dream for men. The notes are inviting to try it. Just tried A Scent at the Duty Free. Really interesting for about 30 minutes — very green and floral (but in a chilly aquatic way) with a dose of galbanum throughout, until it fades away to clean soapy freshness. Too bad, I wish it held on to its atmospheric tropical-ness, but it’s still really good and totally wearable — and good price, too! Thanks again for the review, Kevin, wouldn’t have sought this out otherwise. just returned this gorgeous fragrance for a refund …. lasted only an hour on my skin and that includes layering with the body lotion .Sooo disappointed . Strong green top note but dried to nothing on me. At NZ$190.00 100ml I think its a tad over priced . It sounds like a dream (the Miyake). Is it as green as Envy? Envy to me is fresh cut green. Thanks for the reviews Kevin. If anyone cares, the Brasil Dream for Men has started hitting Marshalls/TJMaxx for 20 bucks. A great deal for an outstanding scent! Royal, I care! I found the Brasil Dream today at Marshall’s and was VERY excited because I have been kicking myself for months after not buying it at the Canada Duty Free. It is a wonderful scent and also a great price. I will be wearing this all spring. I was so disappointed the first time I tried ‘a scent’ but then saw my local Boots was selling 50ml bottles for £12.00 (100ml £16.75!) – £12.00??!!? That’s pratically free! Is it really doing so badly they’ve had to sell it as clearance already? Anyway, at that price, I felt compelled to give it another squirt. Still wasn’t sure. But have found myself coming back to it to try again and again – until today I bought it. How could I have been disappointed by it? It’s pretty warm and humid in the UK at the mo and I started my day wearing Miller Harris Figue Amere – I want cool, I want clean, but still interesting… and suddenly ‘a scent’ makes sense. Smell it once, twice, three times or more and then realise what at first appears so simple really isn’t – it’s everything Kevin says – and achieves the remarkable feat of being both clean and lush at the same time! Apparently the name isn’t just cutesy post-modernism – it’s meant to be a play on words, like L’eau d’Issey (“l’odyssee”, French for odyssey). “A scent” = ascent. As in, ascending that Japanese mountain that this doesn’t smell of. Ascent (I’m just going to call it that) does skew feminine – those floral notes aren’t shy – but not unwearably so for a man, I think. The freshness, clarity and relative dryness, not to mention the green edge, make this one smell pretty unisex to me. I can actually imagine more than a few of the classic green florals working well on men, in the appropriate dosage (light! ).